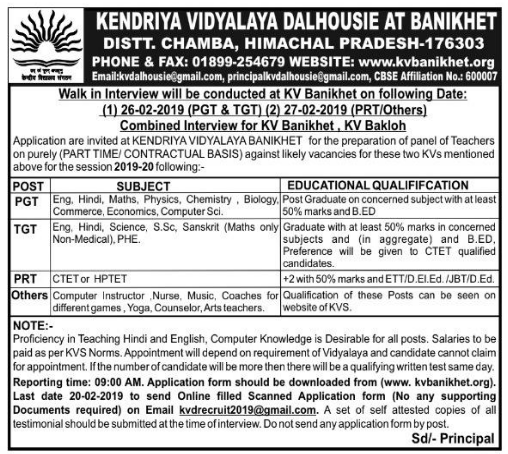 Kendriya Vidyalaya, Chamba has advertised for recruitment of Teachers jobs vacancies. Interested and eligible job aspirants are requested to apply on or before 20th February 2019. Check out further more details below. About School: Kendriya Vidyalaya Chamera-II is established in the year 2000.It is situated in NHPC CPS-II Campus near Ravi river. Vidyalaya is located 5 km from Chamba City. This vidyalaya is affiliated from CBSE. Vidyalaya is running with single section and only science stream from XI- to XII. How to Apply: Interested candidates are requested to send scanned copy of filled-in application form (can be download from school website given below) along with to the email address. No documents to be attached. But, a set of self-attested copies of testimonials should be submitted at the time of interview. To Download Application Format: Click Here or copy this link http://www.kvbanikhet.org/public/unifam/12144-applicationformkvdalhousie.pdf and paste in your chrome browser to open and download the file.